Virat Kohli posted an average close to 100 in T20 cricket in 2016. While that itself is quite incredible, this is only the tip of the iceberg. And the iceberg called Virat Kohli is right now big enough to plough through any Titanic that crosses his path. Earlier this week, Kohli joined his Royal Challengers Bangalore teammate AB De Villiers to fashion a 229-run partnership in the IPL against the then league-leading Gujarat Lions. This was the game’s highest ever partnership in T20 format. Even more importantly, it was an exhilarating exhibition of sublime caresses to the boundary between seemingly impregnable field settings, interspersed with some brutal hitting of an ever increasingly disoriented attack unaccustomed to such treatment. And this from a man, who barely two months ago, very humbly maintained that each batsman has his own strengths, and his was to play cricketing shots, without the power to hit big sixes. In this IPL, he has so far hit 33! As an aside, even before we get to the final stage of the IPL, Kohli has scored four centuries, completed 4000 runs in the IPL, knocked off the highest number of runs for any batsman in a single IPL tournament (865 from 13 matches), with an average of 86.50 and a strike rate of 155.01. His batting has been so sublime, it hasn’t even made the headlines that last night’s 113 scored from 50 balls against the Delhi Daredevils was despite the seven stitches keeping his left-hand webbing together. That’s not just grit and dedication, it’s sporting legend in all its glory. Let’s look at Kohli’s longer version career so far. 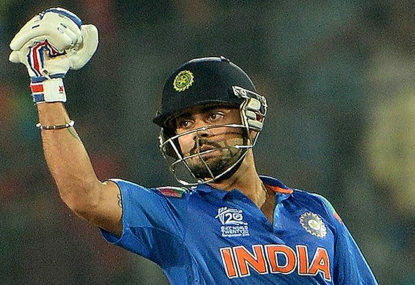 Since making his ODI debut in 2008 and Test debut in 2011 (yes, this phenomenon called Kohli has only been around in Test cricket for five years, amazing as it may seem), he has scored 36 centuries in the two formats combined. Thirty-two of these have been scored in the five years since 2011 in 138 combined matches. In the first five years of his career, as a comparison, Sachin Tendulkar scored ten centuries from 125 combined matches. Ricky Ponting in the same period in his career scored 11 tons in 124 combined matches. The possibilities, if Kohli plays on for as long as Ponting and Tendulkar, are just mind-boggling. The remarkable thing about Kohli is that, unless a new format of the game were to be invented tomorrow, he is pretty much the best batsman in the world today, across all formats. If anyone is still unimpressed with an average just below 100 in the IPL, surely the fact that in T20 Internationals his average went from 96.25 for 2014 to 125 for 2016 will bring a disbelieving shake of the head from such a doubting Thomas. And, of course, unlike the brute strength and bludgeoning of a Chris Gayle or the superb power play of De Villiers, Kohli is pure poetry in motion. Restricting a fielding team to just 11 fielders is a travesty of justice when Kohli is batting. The hapless Gujarat Lions earlier in the week and the Kings XI yesterday, will, I am certain, seriously look at a golf-like handicap if offered one. This 25-year-old man with the aggression of a Bengal Tiger on the field, guts and dedication streaming from every pore in his skin on the playing field, the soft shy smile off it, is also a quintessential member of the generation that openly lives their life off the field on Twitter. Kohli grew up quickly when he lost his father at the age of 18, and played a Ranji Trophy match for his team the next day before attending the funeral. But the captaincy of the Test team bestowed upon him midway through the Australian tour by a jaded MS Dhoni has acted as a nectar of the Gods and put him on a completely different plane from his fellow cricketers on the field. It has also brought, almost miraculously, a level of maturity far beyond his years. This is a phenomenon called Virat Kohli, one the world will be talking about for many decades to come. He is being called the Donald Bradman of the shorter version. But in years to come, that epithet may not be enough. When he comes into bat, drop everything you are doing, put your feet up, and get ready to be mesmerised by sheer poetry in flannels. The Don would have been proud of this young man.